This Wheel is out of print. You can find it in the Collected Wheel Volume III. 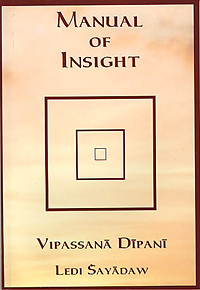 Knowing that reliable information on the practice of insight meditation was much needed by practitioners in the West, the renowned Burmese master Ledi Sayadaw wrote the Manual of Insight (Vipassana Dipani). In this work he covers subjects such as the distortions of perceptions (vipallasa), the conceivings (mannana), the stages (bhumi), the Noble Truths (sacca), the causes of phenomena, the higher knowledges, Nibbana, etc. Each of these subjects is fully expounded and furnished with brief descriptions, some of which are drawn from the Pali texts, while others are the product of Ledi Sayadaw's own teachings.